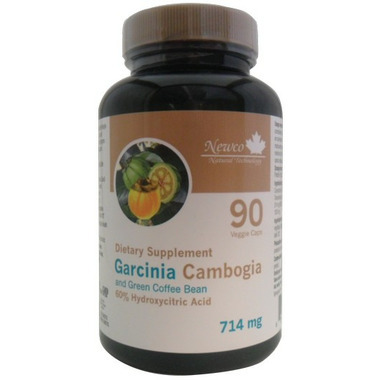 Newco Garcinia Cambogia & Green Coffee Bean offers antioxidants and caffeine to help destroy free radicals and fat build-up. While it accelerates the body's fat burning process naturally, Newco Garcinia Cambogia & Green Coffee Bean also boosts energy and vitality levels. It naturally curbs cravings & reduces appetite. Medicinal Ingredients: Green Coffee (Coffea Canephora, Seed) 500 mg (50% Chlorogenic Acid), Malabar Tamarind (Garcinia Gummi-Gutta, Fruit Peel) 214 mg (60% Hydroxycitric Acid). Extract Ratio 7:1 QCE* = 1500 mg. Seems to work. It reduces your appetite.